In this post I’ll show you how to let your customers to trigger black holing for their prefixes. What I will write is based on my previous post GNS3 Lab: Remote Triggered Black Holing: same scenario, same startup config (the final one of that post). What is customer triggered blackholing? Suppose a customer notices one of its hosts is under attack; using customer triggered black holing he can stop malicious traffic toward the attacked host at the ISP edge, and he can do this without the need to ask the provider’s NOC to run RTBH. While the customer’s staff is analyzing the attack, other hosts remain reachable from the outside, because just the attacked host has been black-holed. Furthermore, all RTBH features can be used: if the customer knows the attack is coming into ISP network from a specific upstream provider, he can just black-hole the attacked prefix on the ISP edge routers facing this specific provider, maintaining full service for networks behind other upstream providers. Of course, when the attack is over, he can resume the prefix and the regular traffic toward it, always avoiding to ask provider’s NOC. Customer-triggered blackholing let our customers to lower their response time against attacks and it also lower work load and liability of our NOC. To let our customers to activate RTBH we just need them to announce prefixes they want to black-hole using the specific BGP community. For example, if customer 10 (AS 65310) wants to black-hole 192.168.10.20/32 toward ISP2 (AS 200) he just has to announce that prefix with community 300:102. As we already did in the Core router, our customers will trigger RTBH just adding a tagged static route toward the prefix they want to blackhole. As opposed to the Core router’s RTBH route-map, here we have to remove the no-export community from the set community statements, otherwise black-holed prefixes will not cross the customer’s AS borders. *>i192.168.10.20/32 192.0.2.1                0    100      0 65310 ? Of course we need strong policy enforcement on the customers facing edge router (Edge3) in order to avoid customers to announce prefixes assigned to other customers, or to use unproper communities. 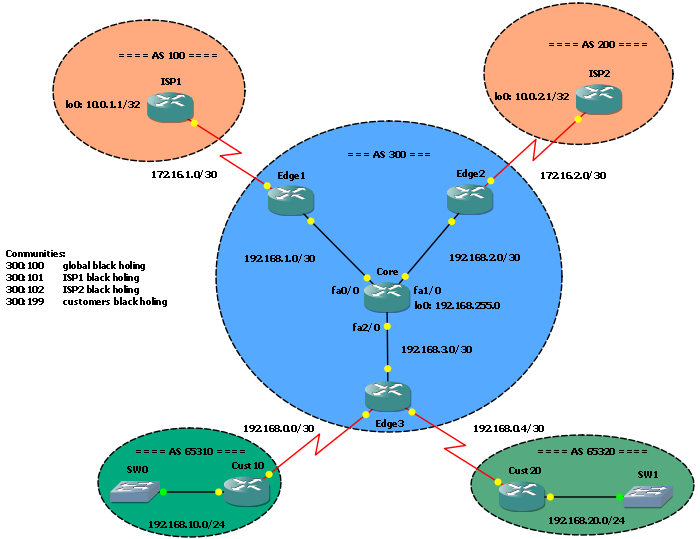 You can download the GNS3 Lab here. Within the .zip file, in the config directory, you can find the previous post configurations and the new “4. Customer trigger blackholing” subdirectory containing the final config. Hi Unixx, you can try to edit the .net file (you can use a simple text editor like Notepad) and replace 127.0.0.1 with localhost. I hope this works! How is the customer authenticated? I mean what stops any IP in the AS from blackholing any other IP? You may add filters on the provider’s edge router, Edge3 in the example, so only customer’s subnets will be accepted.